Every now and then, two things come together in order to form one amazing combination. You know, like peanut butter and jelly, or cookies and milk. Now, the fusion of Shark Week and The Mountain Tees is quickly becoming a pairing for the ages. That’s because for the second year, we are proud to be the creator of some pretty epic tees for what has become the unsung holiday of summer—Shark Week! Wearing a Mountain tee is all about displaying your passion, exhibiting a piece of art, and living life out loud. When it comes to Shark Week, one thing is exceptionally clear—there is a large base of super fans, shark “fin”atics, if you will, who eat, sleep and breathe Shark Week gear. With The Mountain Wholesale Shark Week Collection, you can bring these one-of-a-kind tees to the masses of merchandise hungry Shark fans. Still not convinced that Shark Week’s wide appeal will result in a sales opportunity for you? All it takes is a quick Google search for “Shark Week merchandise” to recognize that Shark stuff is everywhere. 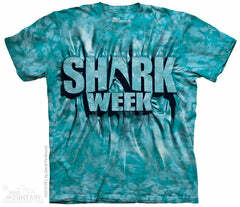 If you want to stand out from your competition, carrying Shark Week tees by The Mountain is the way to go. You might be wondering why you should get on board with a fleeting summer trend that is sure to fade. The answer is because Shark Week is more than a trend—now in its 28th year, it has become a summertime fixture. Fans anticipate Shark Week all year long—they cannot get enough of the shark! Gaining in popularity each year, Shark Week is here to stay—and so are Shark Week tees by The Mountain. Do you own a shop near an ocean, sea, or lake? Maybe you operate a store in or near a water park or an aquarium. Even if you’re in the middle of the desert, the point is that Shark Week resonates with everyone. Last year, an estimated 2.5 million people tuned in to Shark Week programming. How many of those people could be potential customers setting foot in your shop? Now is your chance to reel them in with official Shark Week tees by The Mountain. With this exclusive collection of Mountain tees, you can capitalize on an established franchise with a loyal customer base–half the work is already done for you! At The Mountain Wholesale, t-shirts is our primary business and we are invested in your success. We want to equip you with the tools you need to increase your sales of Mountain tees. This is why we have created Shark Week display posters for you to place in your shop so that fans know exactly where to find the hottest Shark Week tees of the season. Are you utilizing one of our convenient display options? We provide ample Shark themed signage to show your customers how they can join in on the feeding frenzy of Shark Week merchandise. The bottom line is that by adding The Mountain Shark Week tees to your shop floor, you may be tapping into a whole new set of customers who are chomping at the bit for shark themed apparel. Do you remember the popular phrase, “If you build it, they will come,” from the movie Field of Dreams? Well, you should embrace this mantra as you consider ordering wholesale t-shirts from The Mountain just in time for Shark Week—which begins June 26th on the Discovery Channel. What are you waiting for? Make a splash in your summer sales by stocking your tank with exclusive Shark Week tees by The Mountain. Too many shark puns? Is that even possible?